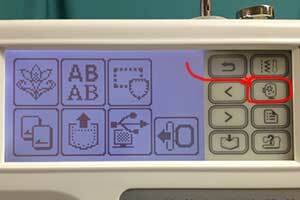 You can quickly get to the home screen from any screen by pressing the Embroidery key on the Control Panel. The icon looks like a hoop with a flower in it. I’ve circled this key in red in the photo on the right. Brother calls this key the “Embroidery Key” in the Operation Manual because you press it to get to the embroidery home screen to start embroidering. 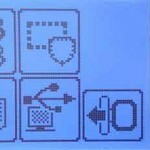 Use this key to get to the home screen for the Brother SE400, SE350, LB6800PRW, PE500, and similar machines. Note: For the Brother PE500, the key is at the top of the right column because there are no sewing functions and therefore, no sewing home key. 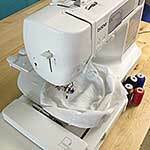 My Brother SE400 will not allow me to use push button sewing. I am getting the message “change the speed control mode to off” I see nothing in the manual on how to do this. Help please! I’ve got a Brother SE400 I have problems with the Embroidery it doesn’t look neat like it should I’ve tried everything to correct the stitches be it still doesn’t look neat like it should. I have had 2 other embroidery machines that were brothers and I never had any problems embroidery with them They were so simple to use. I had the Disney one and I can’t remember the first one I had .you could embroidery only on it Please help I don’t know what I could be doing wrong.